Handmade in the USA, these striking paperweights are hand-blown using traditional techniques, melting ingredients to 2350 F and forming the shape upon the end of a blowpipe. Inspired by the shapes and textures of the natural nautical world, swirling ripples are emphasized by contrasting speckles of color. 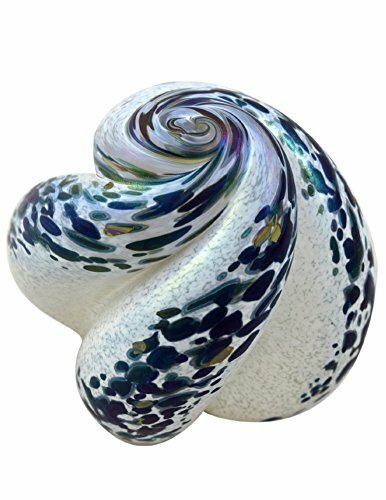 Standing approximately 3" tall and wide, the nautical swirl functions as a handy paperweight or as a splendid decorative element in your home. Available in 4 colors, each with an iridescent sheen that shines beautifully as it reflects light. Please note: as each nautical swirl is individually made by hand, shape and size will vary slightly. Each is a one-of-a-kind creation.